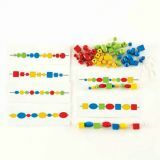 Copy the image card bead pattern and then string the beads. Contents - 72 beads in 3 shapes, 3 different sizes and 4 colors - 6 game cards printed both side - thread. Age: 4+ Years.